We took a break from construction sites by visiting the Exxon Mobil Exploration office. The GLCM has enjoyed a healthy partnership with Exxon over the years, seeing 7 alumni currently working for the company, 3 of which were from the class of 2013. Angela Almada, President of the division of exploration and production in Brazil, welcomed us to their office is opened our meeting with an overview of Exxon’s history in Brazil. They have had a presence in Brazil for just over 100 years, mostly in the downstream (gasoline sales) operations. This changed in the mid 90s and 2000s as Brazil opened an exploration and production office (upstream operations) and divested almost all of their downstream operations assets by selling them to a company called COSAN. Currently, Exxon Mobil has purchased drilling access in two blocks about 300 km off the north-eastern coast of Brazil. 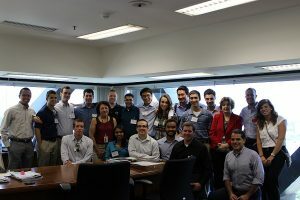 Before we could go enjoy Rio’s beautiful Ipanema beach, we had lunch and took the bus to AECOM’s office to hear about the Olympic Park’s master planning and design. AECOM United Kingdom had done the same work for the London games which gave them an advantage to win the work for the games in Rio. Petar Vrcibradic, project manager, spoke with us for over an hour about the design iterations and progress of the master plan designs. 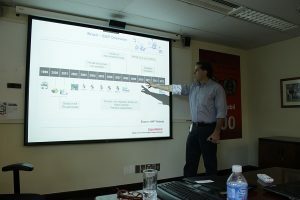 Two of the unique challenges that faced his team were a short time frame and complex client relationships. Rio started the master planning and design process about 2 years later than London had. So right from the beginning, Petar described feelings of a time crunch. On top of that, he explained the difficult of having over 200 different clients to coordinate with on the project. From the International Olympic Committee, to Brazil, to Rio de Janeiro, to the public to hundreds of athletic organizations, it was a challenge to try to make clients with conflicting interests all happy. In fact, Petar said that with these two challenges at the same time, the goal could not be, “let’s make a perfect Olympic park,” but rather focus on incremental improvements and a successful legacy development. 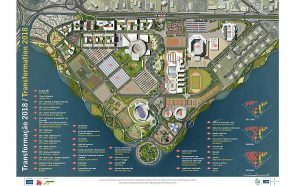 The Master Plan has 3 phases including, Olympic phase, transition phase where they tear down all the temporary facilities, and the Legacy Phase, which is meant to replace the temporary structures with permanent development to benefit the city. 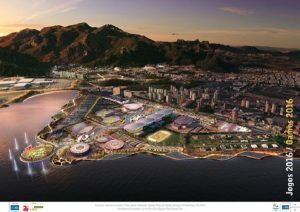 Several large Brazilian developers are responsible for constructing the new facilities, and, in return, receive the land for development after the Olympics are over. Petar left us with an assurance that large problems would inevitable be encountered between now and the Olympics, however, that they would be dealt with and deliver a successful Olympic games while the world is watching.